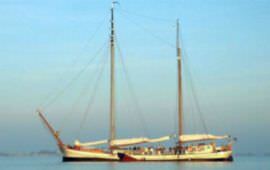 Clipper Passaat - Boat rental? 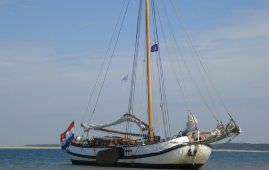 The Passaat is a two-mast clipper fitted out for sailing with guests. As well as having a regular crew on board, facilities include a cosy saloon, spacious cabins, showers and an well-equipped galley. 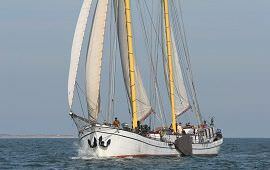 Our home port Harlingen opens out into the beautiful sailing area of the Waddenzee. The Waddenzee reaches from Den Helder to the Eems between the offshore islands and the mainland. 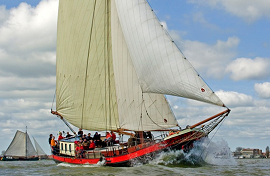 The western part of the Waddenzee has deep, wide channels well-suited to larger ships thus offering endless sailing possibilities while the eastern part with its narrow channels and numerous sandbanks makes sailing a real adventure. All the harbours on these islands are accessible to our ships. 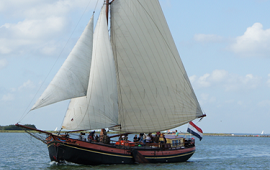 One hour’s sail away from Harlingen, through the Kornwerderzand locks, is the IJsselmeer, or the former Zuiderzee. This large sailing area, approx. 80 km long and 25 km wide has many small harbour towns which are well worth visiting. Routes and destinations are planned together with the crew. 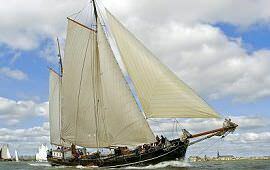 History: In 1900 Marinus Boertien commissioned the building of a fast clipper with sleek lines. 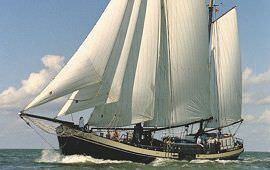 The result was the Passaat, a 33 m long and 6 m wide clipper, originally named Margiena, a combination of Marinus' and his wife's names. 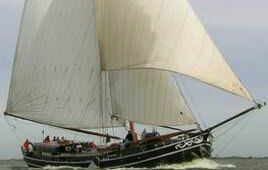 The clipper carried freight on the rivers in the south of the Netherlands until the 1950's. In the 1930's an auxiliary engine was fitted with a side propeller. In 1964 the last Boertien skipper gave up transporting freight. 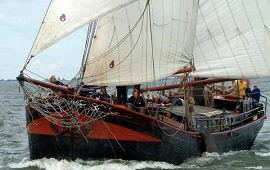 Following a complete restoration this beautiful clipper has now been refitted for charter sailing. Interior: The ship can accommodate a maximum of 28 passengers. The spacious saloon has four tables with comfortable seating arrangements, a fully equipped galley with fridge-freezer, a gas cooker and a 70 litre oven. There is also a beer pump. The cabins have double, insulated walls, are spacious and fitted with bunks (2.00 m x 0.75 m) including pillows, pillow cases and undersheets. Each cabin has its own wash basin with hot and cold running water, a cupboard, clothes hooks and storage space for bags. The entire ship, including the cabins, showers and toilets, has central heating. Above deck there is ‘tween deck with benches providing a safe and sheltered spot while under sail. Extras: oven, radio and TV connections, CD player.